Iceberg Songs is a project that aims at raising awareness of the fact that the icebergs in the polar regions are melting quickly. However, melting icebergs are simply too far away for most people to be emotionally attached to this global issue. The Iceberg Songs were composed to overcome this emotional distance. Scientists recorded the natural, yet hauntingly odd sounds arising when icebergs melt. In collaboration with the UN Framework Convention on Climate Change (UNFCCC), internationally renowned musicians turned these sounds into songs for the purpose of making them heard worldwide. With the start of the World Climate Conference 2015, the compositions were visualised with WebGL technology and published under icebergsongs.com to provide an intense listening experience. Each second that visitors spend listening to the songs is counted. At the end of the project, politicians are asked to spend an equal amount of time as the accumulated listening time on finding solutions for the global issue of climate change. 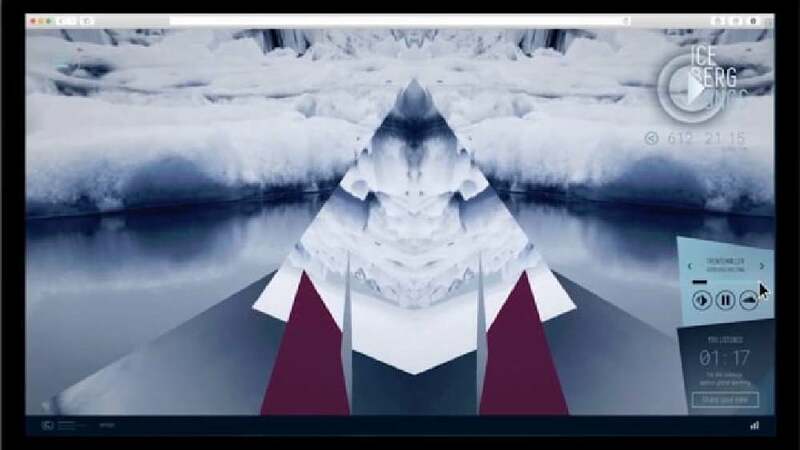 This project is fascinating in that it takes one silent phenomenon caused by global warming – the melting of icebergs – and creates a sound identity for it. Sounds never heard before are recorded and, through collaborations with artists around the globe, are turned into music. The result is entirely new sound experiences that, in a manner both intelligent and emotion-ally appealing, draw attention to a problem hitherto hardly acknowledged in people’s consciousness.